Vancouver Secondary Teachers' Association » Latest News » Thanks Irene! 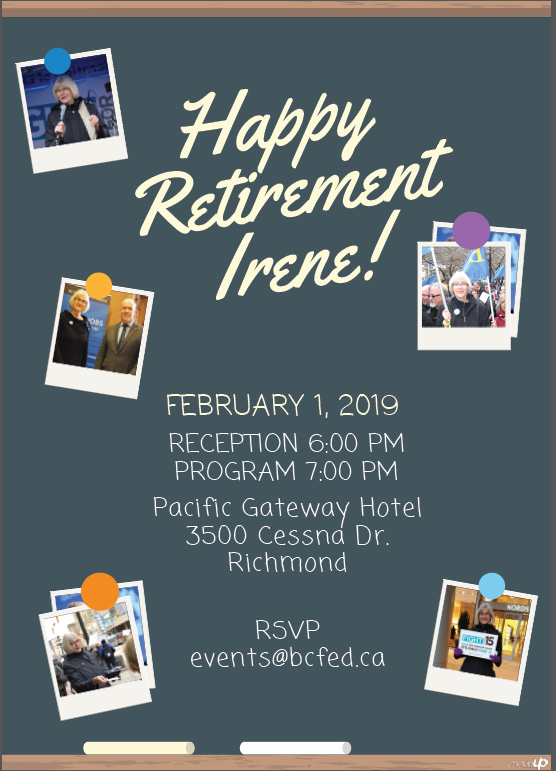 Join the retirement celebration of our very own VSTA Past-President and BCTF Past-President, Irene Lanzinger, on February 1, 2019 at the Pacific Gateway Hotel. Irene was VSTA President from 1997-2000 and BCTF President from 2007-10. Irene was then elected to Secretary Treasurer for BCFED from 2010-14 and then finally elected President of the BC Federation of Labour from 2014-2018. VSTA thanks Irene for her commitment to improve public education and the lives of all workers in our province. Thank you Irene and enjoy your retirement! RSVP here.